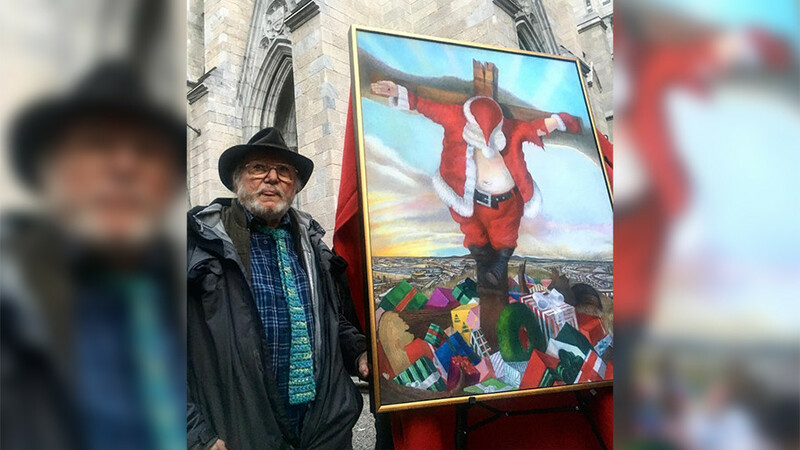 A painting displayed on Christmas Eve in front of St. Patrick’s Cathedral showing Santa Claus substituted for Jesus Christ on the cross has attracted some heated criticism from revelers. American artist Robert Cenedella, 77, attracted the wrath of holiday crowds that gathered to catch a glimpse of his painting depicting Santa Claus hanging on a cross. Just below Ol’ St. Nick’s black boots is a modern representation of Calvary, the site of Christ’s crucifixion, a mount littered with brightly decorated Christmas packages. Amid the gifts are also fallen trees, as well as an old tire, which could be an effort on the part of the artist to portray the environmental damage that modern living entails. 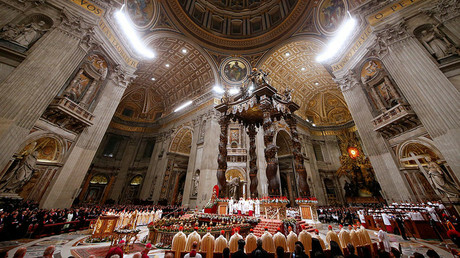 Cenedella’s controversial painting, removed from a Manhattan gallery following patrons’ objections, was put on public display in front of the famous St. Patrick’s Cathedral, arguably the most recognizable symbol of Roman Catholicism in the United States. The painting attracted cries of blasphemy and sacrilege from some passersby. The paper also quoted a mother from the Bronx, Cynthia Rodriguez, 29, who worried what she would tell her kids if they saw the painting. “If they saw this they’d be asking me, ‘Mommy, what’s Santa doing on the cross? Is Santa dead?’” Rodriguez said. However, as Christmas has become more of a commercialized shopping event as opposed to a religious holiday, it seems many people failed to see the underlying message of the painting. This is certainly not the first time Cenedella has experienced criticism for his art work. His new work, “Pence on Earth” which was unveiled in September, depicts Mike Pence dressed as some sort of religious figure, with a giant Trump standing over him donning a crown and holding the Bill of Rights under his arm.